the lasercutter’s lens has cracked and so cannot shoot lasers sadfaceuntil the new lenses arrive happyface. We’ll update you when it’s gonna be up and running again! Running again but please! Do pay attention to the lens. It can fall out from the lensholder. See the image. The grey square with a hole in the middle is the lens holder. 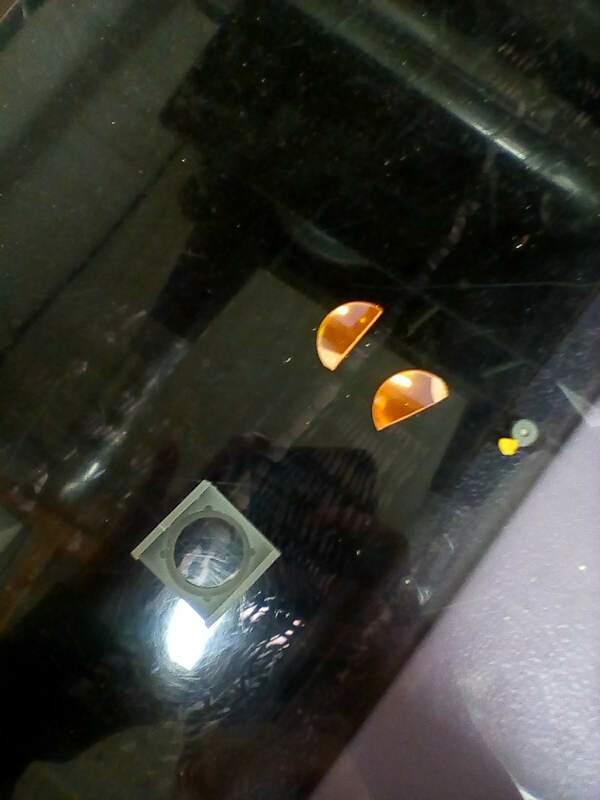 The orange glass is the broken lens. The lens clicks into the holder. If you press on it when cleaning it it can pop out. Clean with care please. worth mentioning that the lens material is safe to touch, but becomes seriously poisonous on contact with stomach acid. If there are small shards of lens, don’t pick them up with a damp finger! Also don’t vomit on them. Heya again, the lasercutter will be out as I resined the lens into the holder and it needs to cure. hey lovely @lasertechs / @petra is the laser back in use again? thanks so much for mending it!